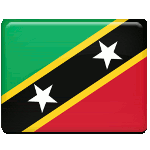 Independence Day in Saint Kitts and Nevis is celebrated on September 19. This public holiday marks the country’s independence from the United Kingdom in 1983. The Federation of Saint Kitts (Christopher) and Nevis is a small island country in the West India. It is geographically part of the Leeward Islands. The smallest sovereign state in the Americas, it is a member of the Commonwealth of Nations. The islands were discovered by Christopher Columbus in 1423. Throughout the 17th century, Britain, France, and Spain made numerous attempts to seize control over the island of Saint Kitts. Eventually, the island was ceded to Britain in 1713. Nevis became a British colony half a century earlier. In 1833, Nevis and Saint Kitts were incorporated into the colony of the British Leeward Islands, which also included Anguilla, Antigua, Barbuda, the British Virgin Islands, Dominica, and Montserrat. In 1958, Saint Kitts, Nevis and Anguilla joined the West Indies Federation as a separate state Saint Christopher-Nevis-Anguilla. The federation collapsed in 1962. In 1980, Anguilla formally separated. The full independence of Saint Kitts and Nevis was proclaimed three years later, on September 19, 1983.